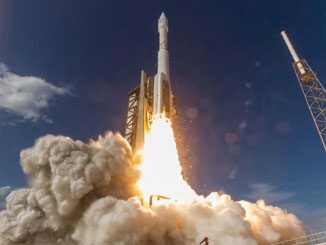 With a 2-to-1 thrust-to-weight ratio, the million-pound United Launch Alliance Atlas 5 rocket unleashed two-million pounds of ground-shaking thrust to power away from its seaside launch complex at 2:13 p.m. EST (1913 GMT) Sunday with the EchoStar 19 satellite. 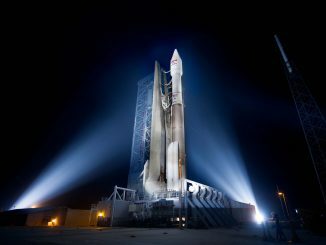 Watch an Atlas 5 rocket launch the EchoStar 19 satellite on December 19, 2016. This view was captured by Spaceflight Now’s camera at the NASA’s Kennedy Space Center Press Site. 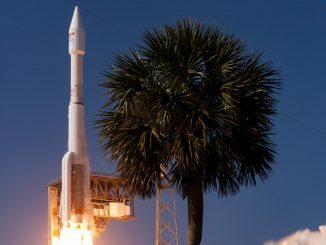 Marking United Launch Alliance’s 12th and last rocket flight in 2016, the Atlas 5 rocket departed Cape Canaveral on Sunday afternoon carrying EchoStar 19 to provide Internet connectivity across North America. 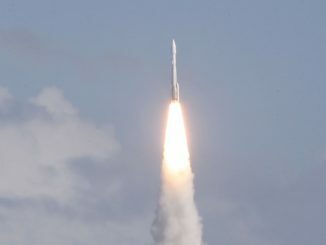 As viewed from the ITL Causeway at the Cape Canaveral Air Force Station, the United Launch Alliance Atlas 5 rocket departs for space with the EchoStar 19 satellite to delivery Internet connectivity across the U.S. 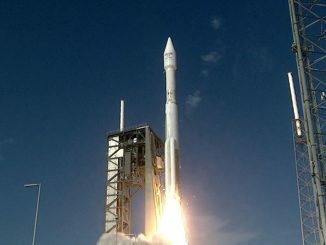 The world’s highest capacity broadband satellite, a craft that will connect rural America to high-speed Internet service, successfully rocketed into space today aboard a United Launch Alliance Atlas 5 booster. 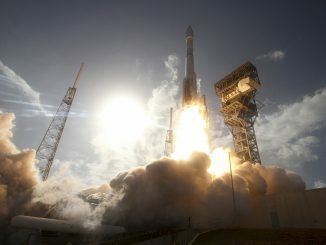 The United Launch Alliance Atlas 5 rocket, standing 194 feet tall and and weighing a million pounds, unleashes two million pounds of thrust from its main engine and three solid-fuel boosters today to launch the EchoStar 19 commercial Internet broadcast satellite from Cape Canaveral, Florida. 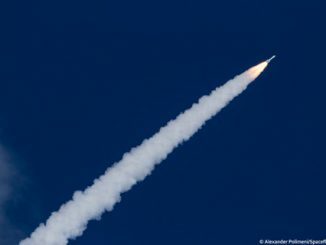 The United Launch Alliance Atlas 5 rocket, equipped with three strap-on solid-propellant boosters for added performance, was transfered from its assembly building to the pad at Cape Canaveral’s Complex 41 today for Sunday’s launch of the commercial EchoStar 19 communications satellite. 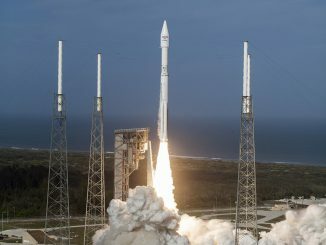 Putting new technology in the sky that will beam high-speed Internet to rural America, a United Launch Alliance Atlas 5 rocket lifted off from Cape Canaveral today to deploy the commercial EchoStar 19 satellite. Follow the ascent in our live journal. 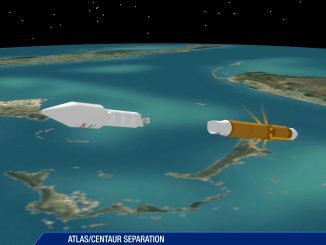 This is the launch timeline to be followed by the Atlas 5 rocket’s ascent into orbit from Cape Canaveral with the EchoStar 19 satellite for HughesNet’s direct-to-home Internet connectivity. 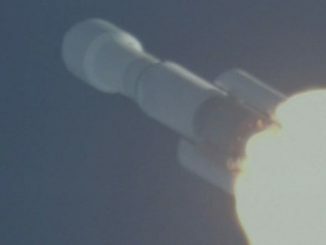 Launch is scheduled for Sunday at 1:27 p.m. EST (1827 GMT).